To be completely honest, the first time I heard of Kazakhstan was in my Intro to World Politics class in college. When we started this world trip, I genuinely had little desire to visit this country. 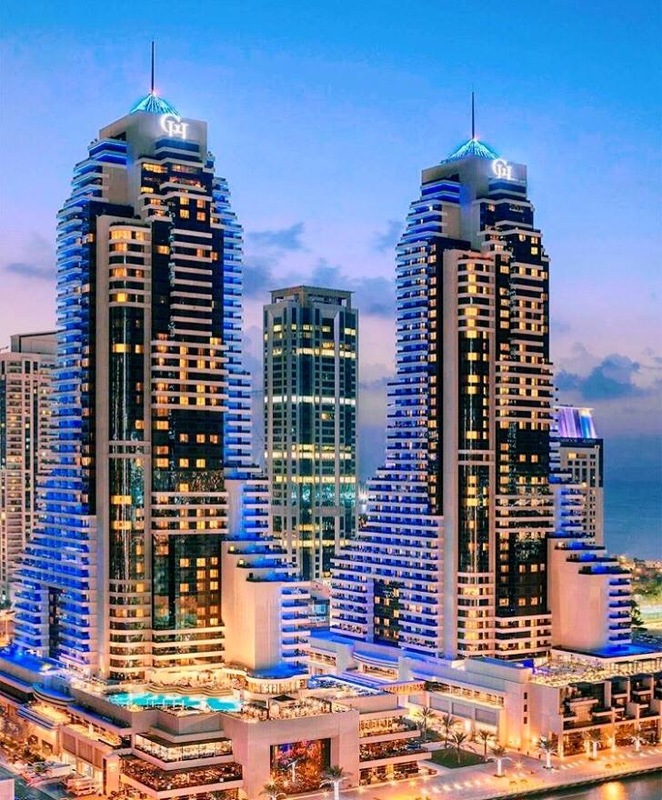 We were in Dubai a month ago and the cheapest ticket out of there was to Almaty. Amos gently broke the news to me and I unenthusiastically agreed to go. 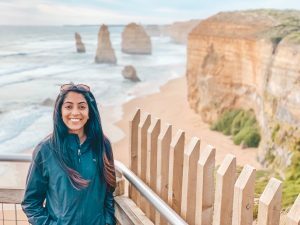 I started doing my research and came to the grim realization that there weren’t very many travel blogs written about this country. I didn’t know what to expect. My whole mindset changed a few hours after we landed. I realized that this country has so much to offer. I’m not going to pretend to be an expert about Kazakhstan. I spent ten days here and only explored a microscopic portion of this country. But, I will fully share my itinerary and some basic tips. 1.) Do you like applying for travel visas and gathering all your important documentation before visiting a country? I LOATHE it. Good news–U.S. citizens no longer need a letter of invitation to visit. Americans can get a tourist visa on arrival as long as you are not going there for employment or missionary work. It doesn’t get easier than that. Be sure to check your country’s status at the Embassy of Kazakhstan where you live. 2.) Our flight arrived at 3:00 A.M. in Almaty. Therefore, we arranged airport pickup from the hotel and I’m glad we did. As we were exiting the airport looking for our driver, we were hounded by taxi drivers begging to take us to our hotel. They cursed us out in Russian when we politely explained to them that we already have a driver. Our transfer from the hotel was actually cheaper than a taxi would have cost. If you’re feeling courageous and want to take a taxi, be sure to negotiate the price before you get into their car and explain to them in detail where you are going. Make sure you have cash because the taxis in Almaty do not take credit card. 3.) Speaking of explaining things, be sure to download the Google Translate app on your phone and download Russian. This app will come into enormous use here. Not very many people speak English. We were able to get around and have conversations with people pretty effortlessly because of this app. 4.) As an American, we found that the exchange rate from USD to Tenge (the currency in Kazakhstan) was remarkably better at banks. ATMs are also readily available throughout Almaty. Do some research when you get there about the exchange rate. 5.) I felt very safe when I was in Almaty, even at night. One interesting thing I read online was that the police are corrupt in Kazakhstan. I did not find that to be true at all. We walked by so many police officers when we were there and they never stopped us. As a matter of fact, they all smiled at us. With that being said, I highly recommend carrying a copy of your passport and your visa stamp just in case you are stopped. Almaty is nowhere as scary as it is made out to be. As long as you are aware of your surroundings and have some common sense, you will be fine. 6.) The people in Kazakhstan seemed to have a little bit of a rough exterior. However, they are so unbelievably kind and helpful when you break through that. If you appear to be a tourist and you seem lost, the locals will help you. Kazakhs are honest and genuine people. 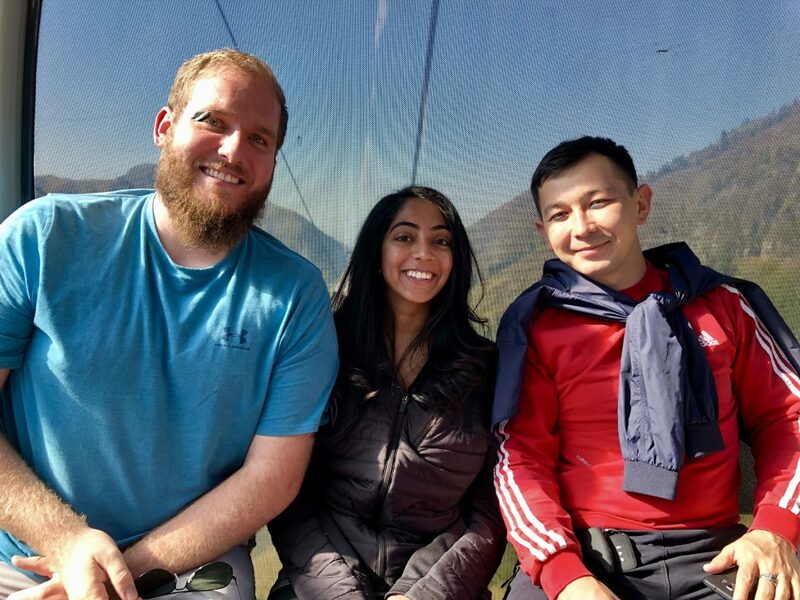 I’ve met two of the most compassionate people I’ve ever met while I was in Almaty. 7.) Tourism right now is mostly non-existent. I only saw a handful of tourists the entire ten days I was there. In my opinion, Kazakhstan will be an up and coming booming tourist destination. I highly recommend going now before it gets infiltrated with tourists. I loved having the entire city of Almaty to myself. 8.) Getting around Almaty is simple. You can walk. You can also take the bus and metro. In addition, Uber operates in Almaty. *Cue your happy dance* Taxis and Uber rides are cheap. You can also stand on the street with your hand out and get picked up by a local who is trying to make a few extra bucks, which is cheaper than Uber and taxis. 9.) I believe that the best time to visit Kazakhstan is from mid-April until the end of September. The weather is warm and perfect for outdoor activities. It gets extremely frigid in the winter and I’m not exaggerating that. Make sure you check the weather before you go and pack the appropriate clothes. 10.) Because Almaty isn’t very touristic, there aren’t hundreds of options to pick from in regards to accommodation. There aren’t a lack of hotels and hostels either though. We stayed at the Mercure. I highly recommend it as it’s in the city center. Be sure to say hello to my friend, Rashid, at the front desk. He’s the best. I’ve attached a link so you can easily check out your accommodation options in Almaty. Did you know that Kazakhstan is the ninth largest country in the world and the world’s largest landlocked country? It’s also the most developed of the -stans countries. 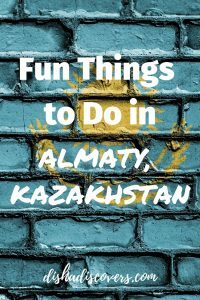 Although Kazakhstan isn’t on most people’s bucket lists, there are many fun and interesting things to do here. I didn’t get to explore very much of Kazakhstan, but I got to see quite a bit. If you are looking for a convenient way to see Almaty, I suggest hiring a driver. We majorly lucked out with our driver. He’s one of the sweetest people I have ever met. He took great care of us and we had great conversations with him despite us not speaking the same language. I HIGHLY recommend him. Post in the comments if you want his contact information. Be sure to check out this book about Kazakhstan to familiarize yourself with the country more. This is the highest point in the city. It is well worth the visit because you get a panoramic view of the city from all directions. There are several cafes and restaurants at the top. You can also find shops, a roller coaster, a playground, statues and a mini zoo. We rode the roller coaster and had so much fun. You can take the cable car up or you can take a shuttle minibus which runs every five or ten minutes. This is the biggest lake in Kazakhstan. It’s probably the most beautiful lake I’ve ever seen. The lake is about 15 kilometers from the center of Almaty. The drive takes a little while because the roads are small and curvy. 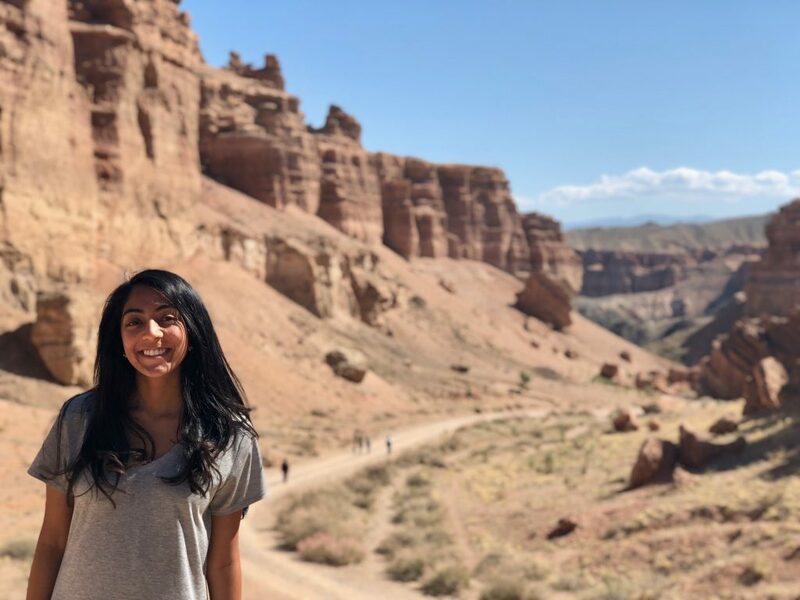 We were lucky enough to visit Almaty during fall so we got to see the beautiful fall foliage on our drive. 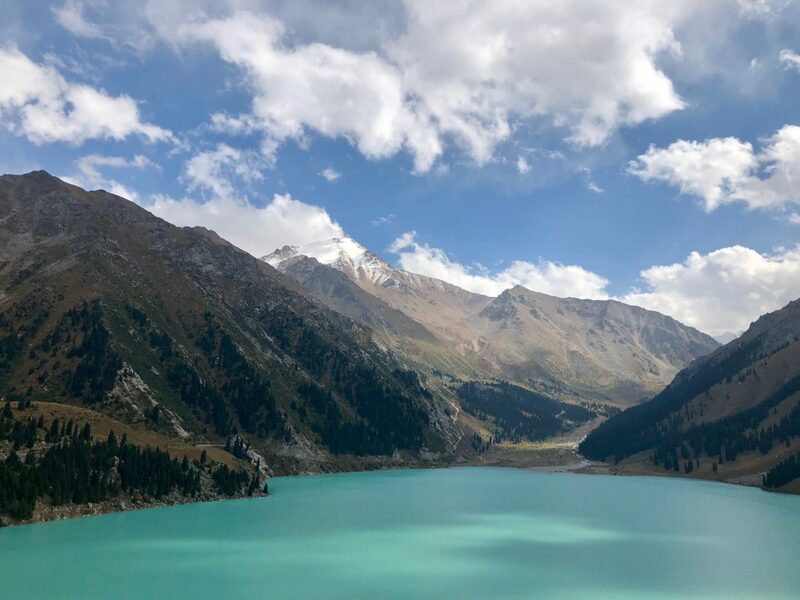 This lake is a major source of drinking water for the city of Almaty. The lake is heavily guarded and some areas are off limits to people. There is no entrance fee to visit the lake, but you have to pay a small entrance fee to enter the park that is at the bottom of the mountain. We heard that the lake changes color depending on weather conditions, but I can almost guarantee that you’ll find it to be stunning regardless. 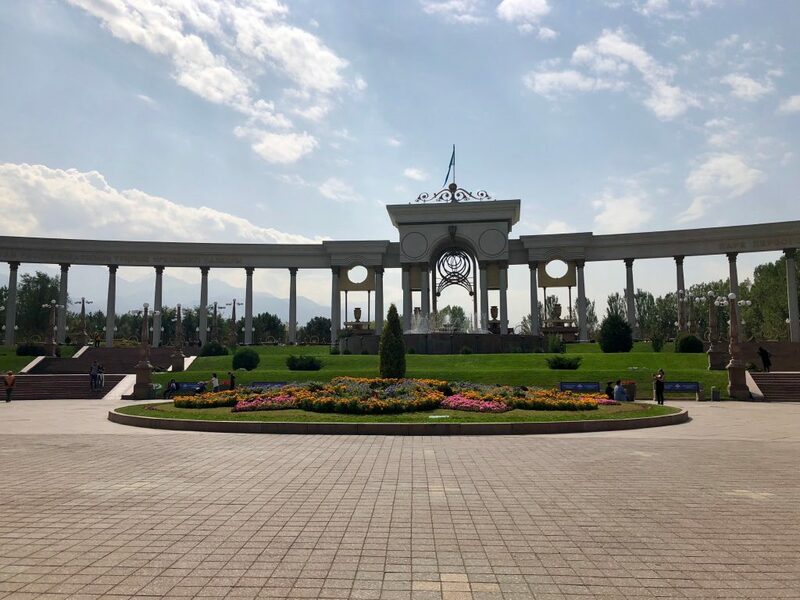 This park is named after the first President of Kazakhstan and is located in the southern part of Almaty. The park is lined with trees and flower beds. The park doesn’t charge an entrance fee. It’s a lovely place to have a picnic. 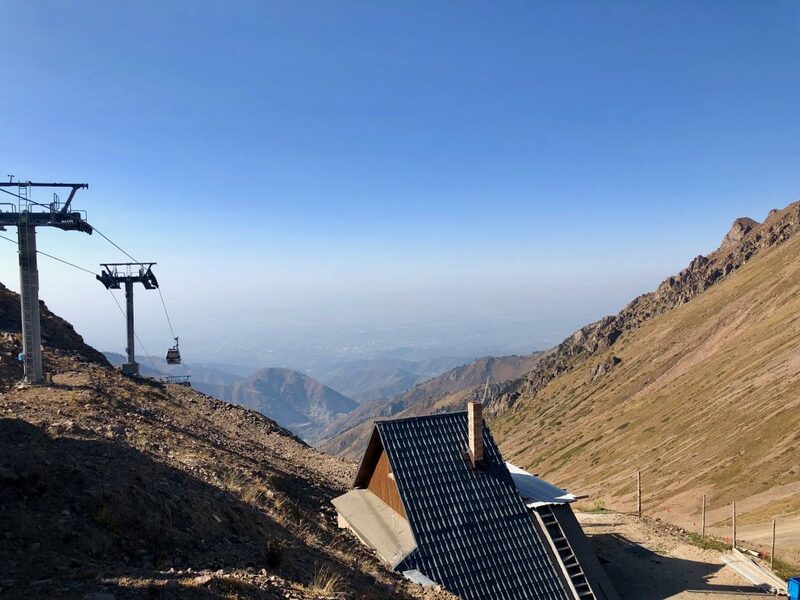 The Chimbulak Ski Resort is located 25 kilometers outside of Almaty and is one of the finest ski areas in Central Asia. Be sure to bring a jacket even in the summer. Take the cable car from the Medeu Ice Rink to the Chimbulak Ski Resort’s lift base. This will take approximately 25 minutes and you’ll be surrounded by stunning panoramic views. You can also grab a coffee to stay warm at one of the stations. 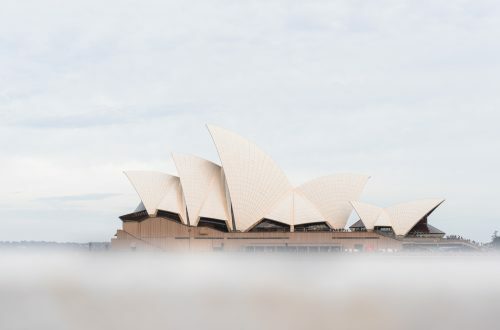 Can you imagine how beautiful this view would be in the winter? 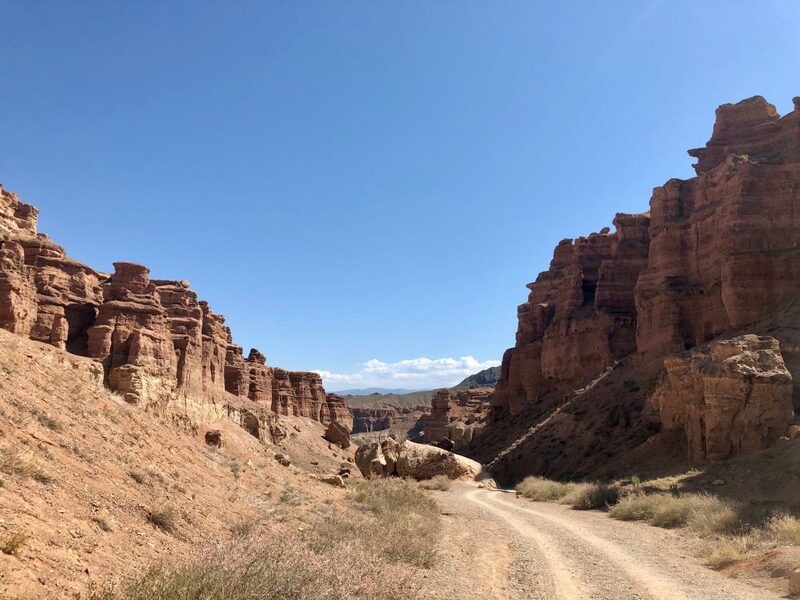 Charyn Canyon is located in Charyn National Park about 215 kilometers away from Almaty near the border of China. If your driver is as amazing as mine, the drive will take about two and a half hours one way. If not, the drive will be around three to four hours one way. 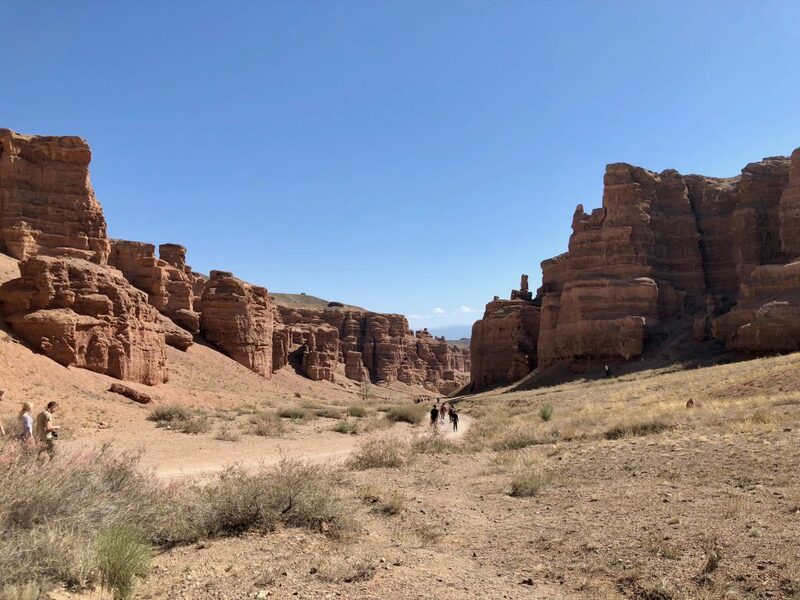 We did a day trip to Charyn Canyon from Almaty and we got to see everything we wanted to see. 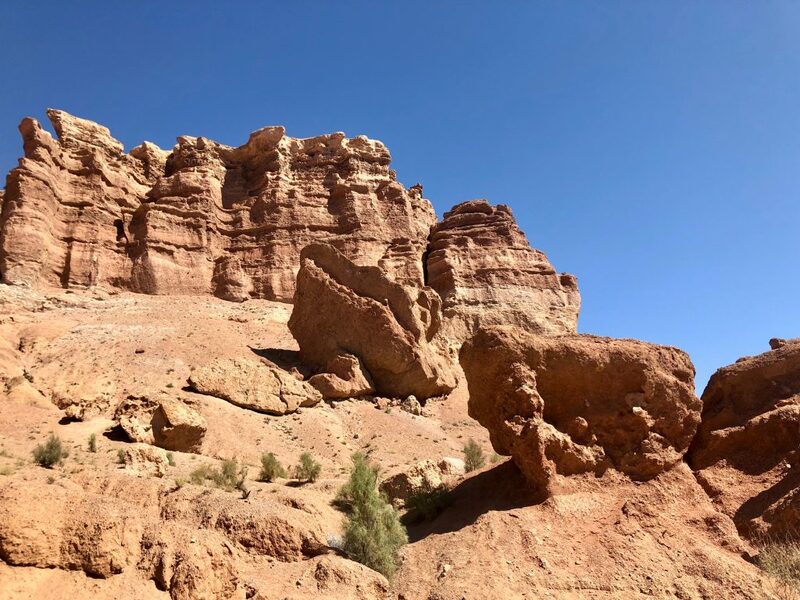 Some describe Charyn Canyon as the Grand Canyon’s little brother. It was so incredible to see the dramatic landscape. I think I said “ooooohhh” and “aaahhh” a thousand times because of the distinct colors and profound scenery. There is an entrance gate before you approach the Valley of the Castles where you will have to pay a small entrance fee. We were not asked for our passports, but I read online that they occasionally ask for them. If you want to camp, you’ll have to pay another small fee on top of the entrance fee. There is also an additional fee if you want to drive around the canyon with your car. If not, parking is available near the entrance of the park. I legitimately had a meltdown while hiking down into the canyon. The descent was awfully steep and filled with gravel. I kept slipping. I was so afraid that I gave up. Fortunately, Amos and our friend motivated me to keep going. I made it down alive without falling and I didn’t die. WOOOO!! We hiked down to the river feeling so proud and accomplished. You can cheat and take a little taxi up to the parking area from the river. I have no shame in doing this. 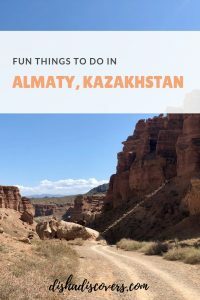 This was an phenomenal experience and you can’t miss it when visiting Almaty. 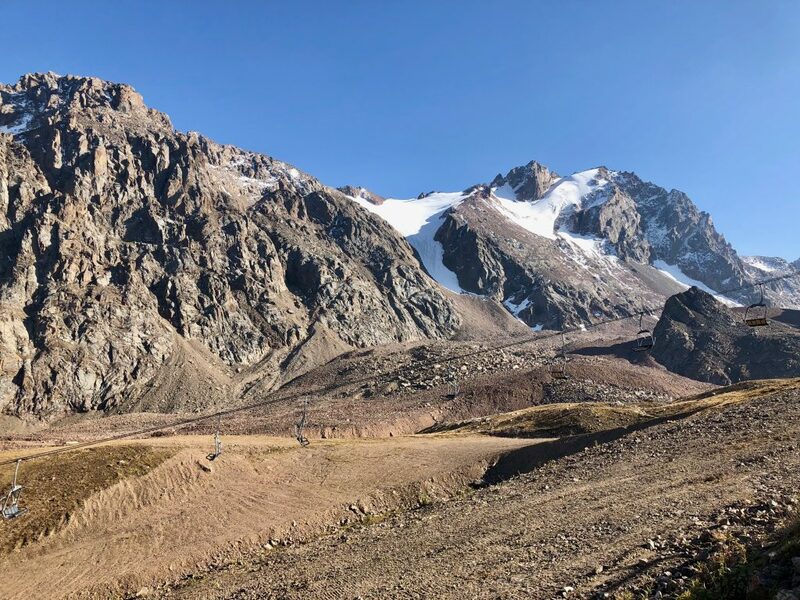 On your way back from Big Almaty Lake, be sure to stop by Falcon Farm Sunkar. Various birds that are unable to survive in the wild are taken in and provided with rehab. The birds seemed well taken care of. The trainer is a fun and passionate German guy. He picks on the audience to assist him. I got to feed an owl. 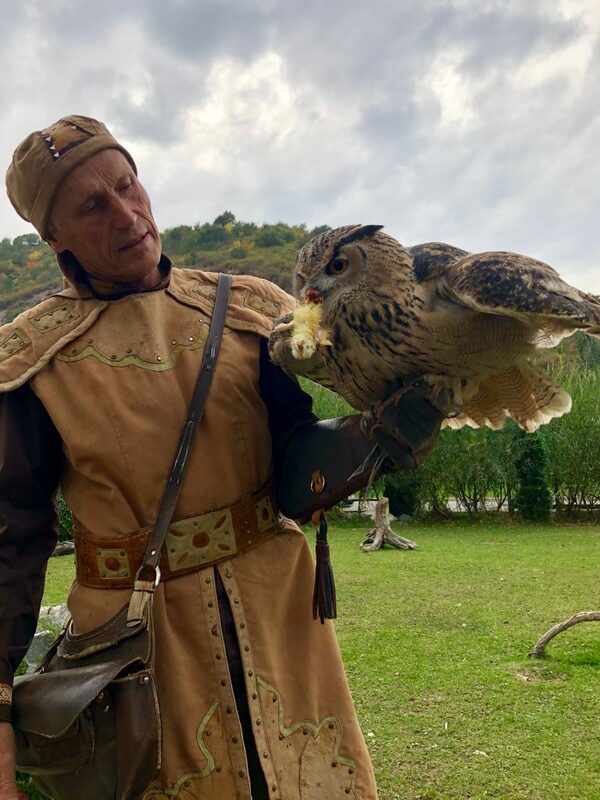 He and his assistant wear traditional Kazakh outfits and do a great job at explaining everything from A-Z about each bird. After the 30 minute show was finished, I left with so much knowledge about these creatures. 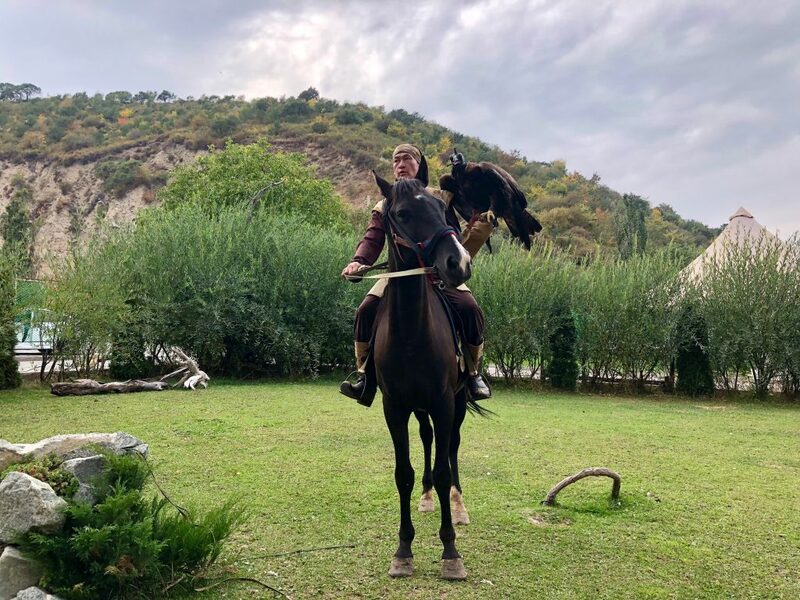 You can’t visit Almaty and not go horseback riding. This was actually my first time riding a horse. Crazy, I know. 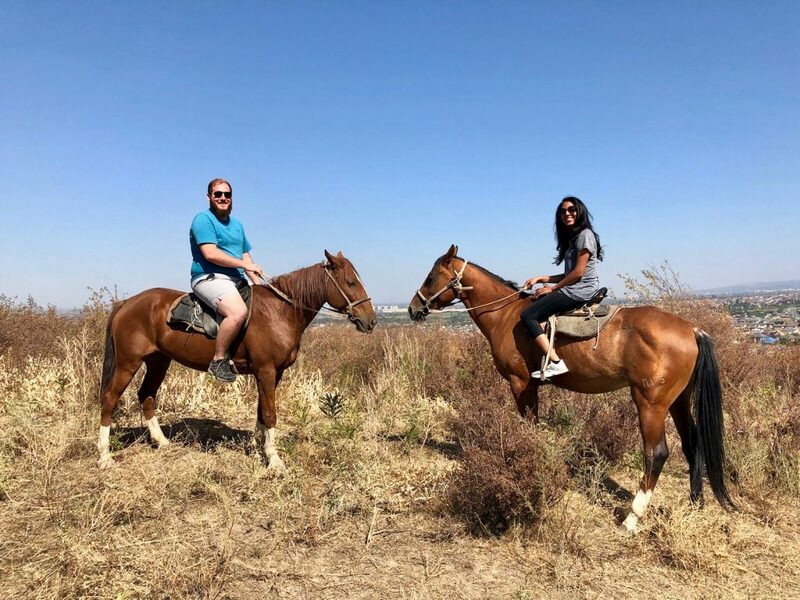 It was nice to escape the urban hustle and have a peaceful afternoon of horseback riding in the country. There are many companies you can choose from. I recommend picking a company outside of town so you’re able to wander off rather than stay on a path. I unfortunately don’t remember the company we used. Sorry, guys. 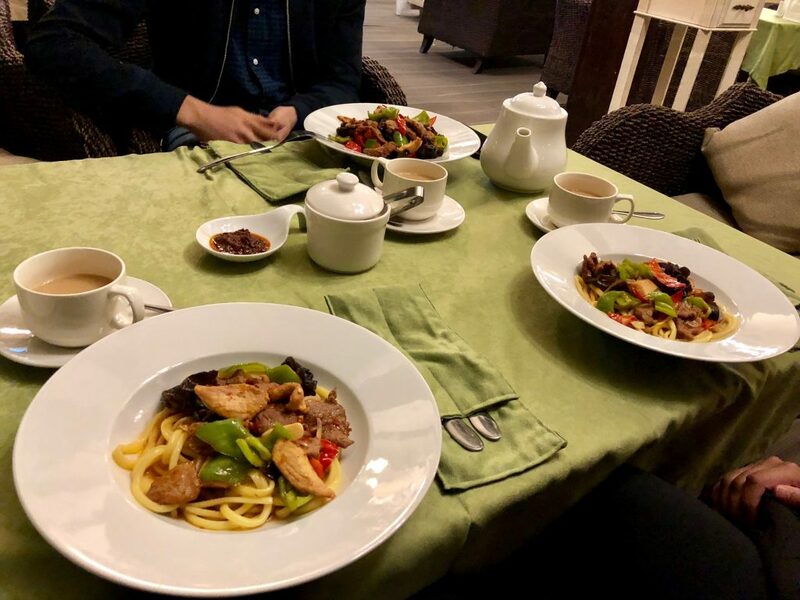 The best thing I ate while I was in Almaty were these Kazakh noodles. The noodles are smothered in beef, chicken, vegetables and a delectable sauce. I couldn’t stop licking the sauce. Don’t forget to order some Shashlik. It’s a dish of skewered and grilled cubes of meat. My favorite was the lamb, but the chicken is yummy too. I sadly don’t have a photo of this dish because we started devouring it as soon as we got it. Kazakhstan is big on tea so be sure to order a pot of it too. It warms you up on a cold day. I’m obsessed with cathedrals so I was excited to see this cathedral. I mean, have you seen the photos? BREATHTAKING! Well, I was met with disappointment when I got there. The entire cathedral was under construction. Still crying about this. 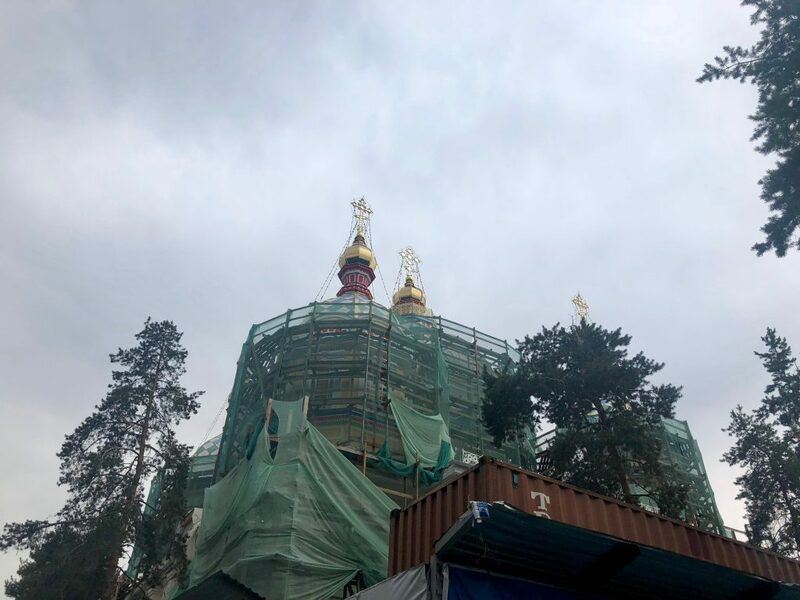 This cathedral is located in the Park of 28 Panfilov Guardsmen. It’s constructed entirely of wood, including the nails. It’s a colorful building that was designed in 1904. It was used as a museum and concert hall in Soviet times. 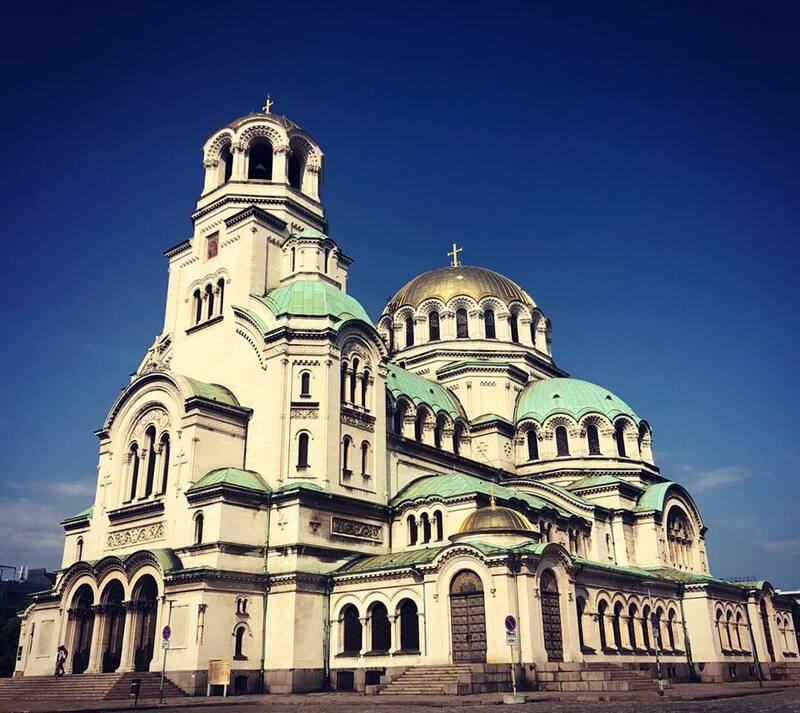 It was returned to the Russian Orthodox Church in 1995. There’s no shortage of bars and clubs in Almaty. Prices are beyond reasonable for alcohol. The bar we went to played American music and Russian music. Btw, Russian rap is so fun!! We had a tremendous amount of fun dancing with the locals and getting to meet them. Sorry to disappoint you guys again–I forgot the name of the club I went to. The DJ was on point and smoking wasn’t allowed inside. It doesn’t get better than that. 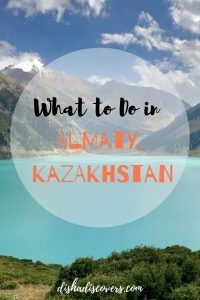 Have you been to Almaty? If so, what did you do? Did I miss anything? Let me know in the comments below. What an amazing adventure! You are both adventurous and brave! many people would not explore a country they didn’t know much about. It looks like you had a great time and I learned a lot from your blog post. Thank you. I had never even heard of this place! The falcon show looks so cool and exciting!! Thank you for reading, Jessi!